Did you know that all of the official major league baseball teams' websites, including the League site, are managed by the same company? MLB.com was created in 2000 to centralize all online media and operations for baseball. 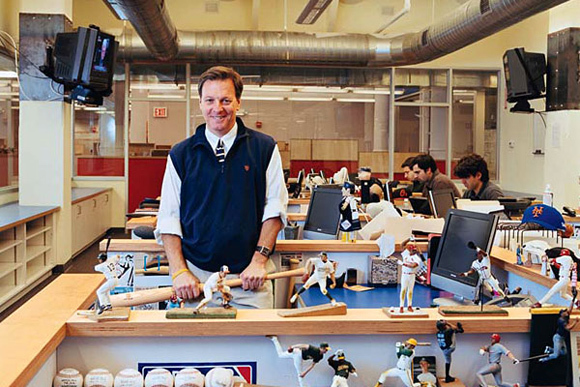 The unified company, MLB Advanced Media LP (MLBAM), handles everything from apparel and ticket sales, to fantasy games and blogs, to player and team statistics, and multimedia video highlights and audio broadcasts. MLBAM has become quite a dynamic organization with a large enough umbrella to encompass all of the teams, their rivalries, and the ever evolving structure of online services. Bob Bowman, the CEO of MLBAM will be in the park tomorrow for our final Breakfast Briefing at the Southwest Porch. His talk on sports and media will round out our sampling from a wide variety of industries this summer. There are still a few more spots for attendees, so register now. The talk includes breakfast and coffee from 'wichcraft. Breakfast Briefings are produced in partnership with Southwest Airlines and Fast Company.